The first ever travel guide dedicated to meeting a country's women. I wrote it after getting tired of waiting for someone else to write guides on countries I wanted to visit. Remember that all ebooks and combos come with a 60 day moneyback guarantee in case you're not satisfied. 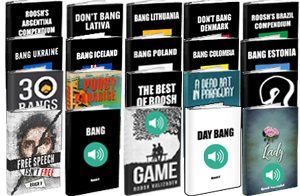 You get a total of 703 pages of expert advice on traveling and meeting girls in Argentina, Brazil, Colombia, Iceland, Denmark, Poland, Lithuania, Latvia, Estonia, and Ukraine, along with over a dozen stories that teach you how to connect with girls by example.